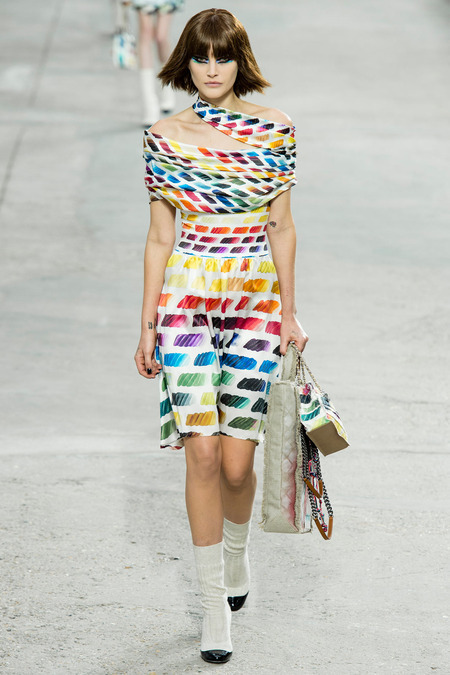 Last October, The Grand Palais in Paris, was transformed into a pop art instillation for the Chanel Spring/Summer 2014 Collection. Karl Lagerfeld, Creative Director of Chanel, designed each art piece in this makeshift gallery that also served as the runway. For anyone who doesn’t know about Lagerfeld, you should definitely look into his biography because for over 25 years he has served at the head of the French luxury house. His inventive designs made the brand one of the most recognizable and desirable by women around the globe. 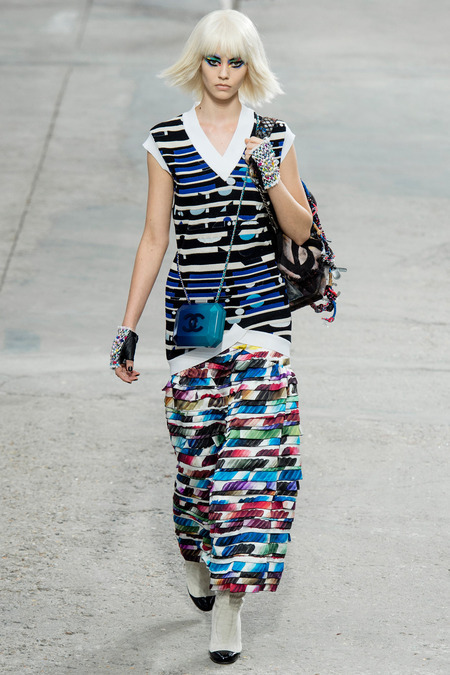 This collection provided a resurgence of color on the Chanel runway. 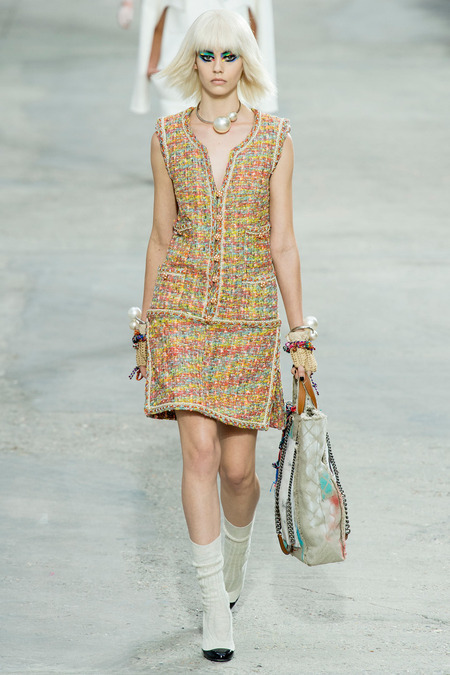 The opening look worn on Cara Delevingne was a lilac tweed vest and skirt with sky blue and violet trim. Accessories included an oversized pearl bracelet and necklace with two large pearls on them. The small iridescent chain link bag looked like it could hold an iPhone or any other smart phone. 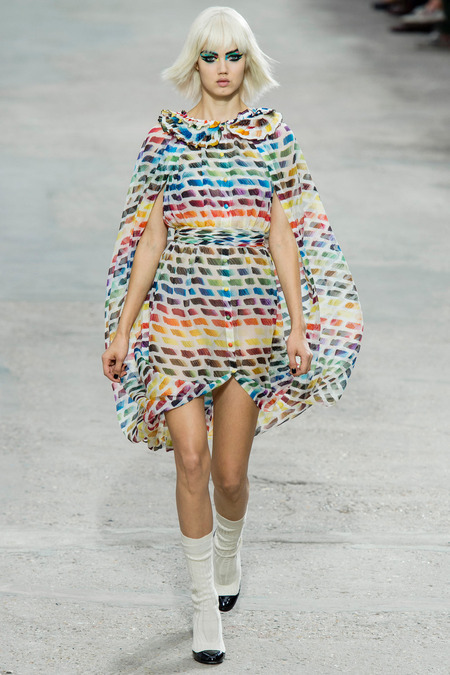 It was a bold look to open the show with and with Delevingne, one of the houses muses, it offered excitement. 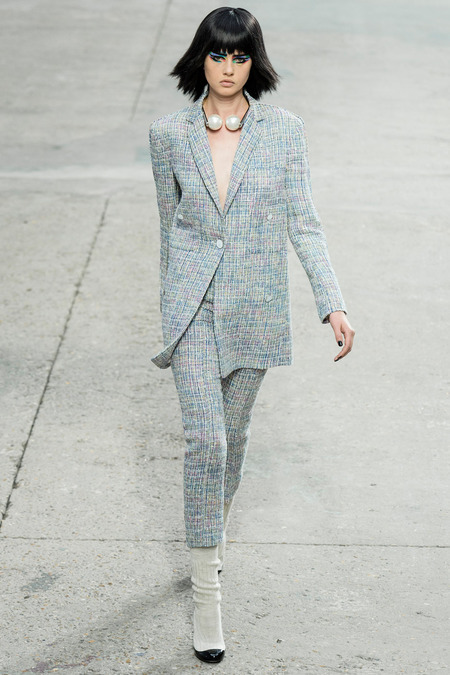 The classic Chanel tweed was reworked into different jackets, dresses, and suits in various colors and patterns. Bags were featured in all sizes but one of my favorite bags was a small clutch looked like it was made from Legos in neon colors. 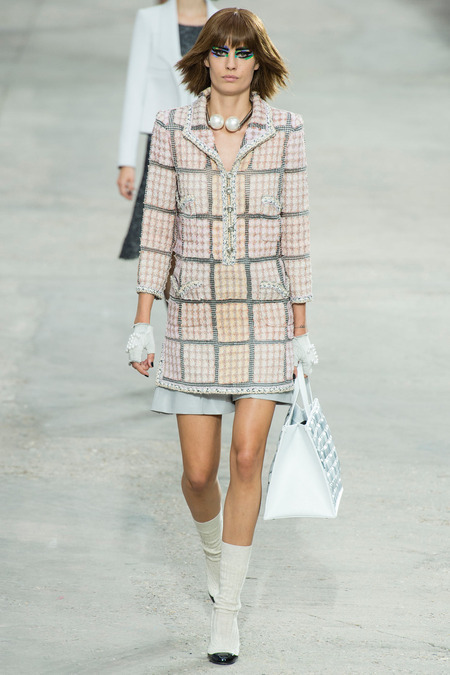 A few of the tweed skirt suits were in pink & white, pink & black, and navy & black plaid tartans offering a punk edge. Two looks were pairs with white tweed jackets. 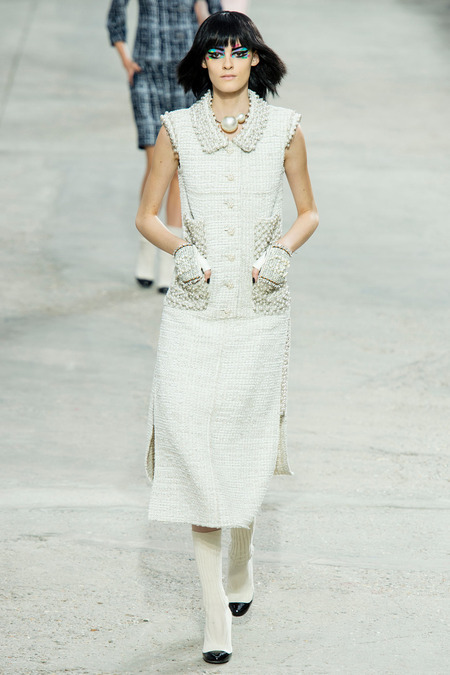 But again the last few seasons, Lagerfeld has created strong and powerful woman that evokes the spirit Coco Chanel herself. 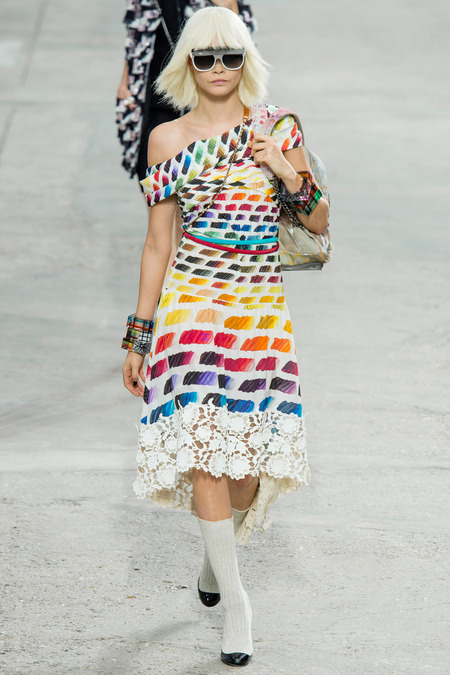 In the finale, Lagerfeld featured weightless dresses with what looked like every colors featured in the Pantone color wheel of paint swatches. 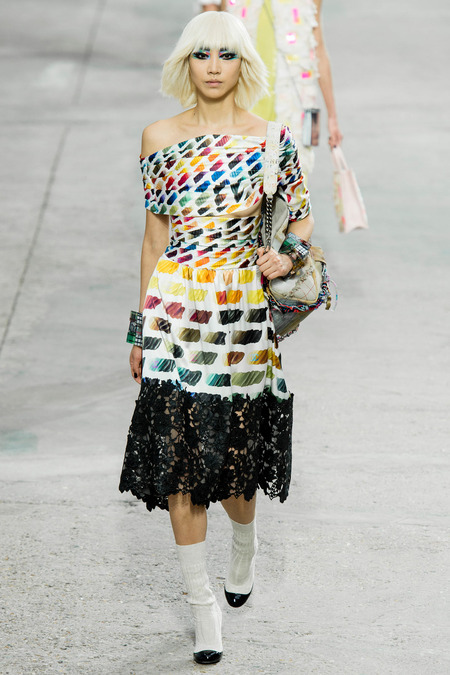 Lagerfeld was enjoying a play on techno-color in such a way that a customer not sure what color to wear, really could wear the rainbow and show off a different hue has she moves. It’s was new play on color and so inventive. Hair and makeup for the show was very bold. Models wore shag wigs that looked like the layers provided a winged affect with bangs. Peter Phillips who is the Creative and Image Director of Chanel Makeup, created a “Birds of Paradise” affect on the eyes. Every color from the collection was on each model’s eyelids. Lips and skin were kept simple and clean allowing the eyes to speak for themselves.